Modern walling, in addition to its main purpose, is an integral element of landscape design, the hallmark of any home. Livability and protection of private property is largely dependent on the quality of the materials that were used for the construction of the fence. 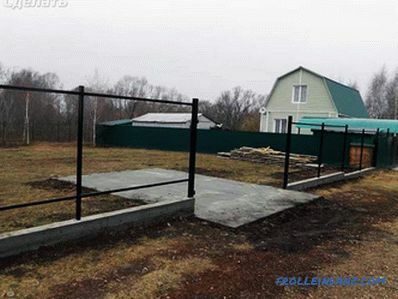 Recently, the owners of private territories, choosing the material for the construction of fences, prefer polycarbonate, which in terms of quality and performance is not inferior to metal, concrete or wood. In this article we will tell you how to make a polycarbonate fence yourself, give photos and video instructions. Polycarbonate is a sheet, transparent or translucent, durable polymeric material resulting from the synthesis of carbonic acid. Due to high quality, practical and operational characteristics, polycarbonate is used in construction, architectural glazing, in the construction of roofing structures, the construction of interior partitions, greenhouse complexes, decorative hanging elements and structures of various types. Unique, special properties of the material allow to embody any architectural and design ideas, regardless of their level of complexity. 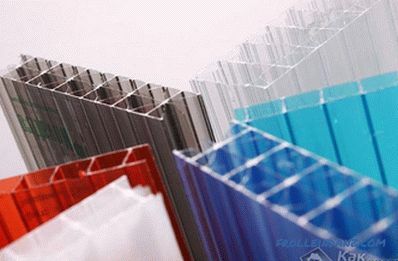 Polycarbonate is produced in sheets, which consist of an inner and outer plate, between which stiffeners of various configurations are located. Sheets of material are available in various sizes, thicknesses and colors. For the construction of protective structures it is very important to know which polycarbonate to choose, taking into account the operational and technical characteristics of the material. monolithic. Sheet thickness - 4-12 mm. the light weight of the material does not weigh down the structure. Polycarbonate blends well with any kind of material - natural stone, metal, wood. 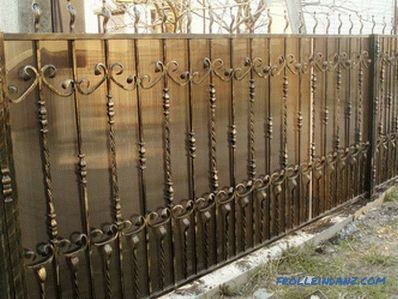 Wrought-iron fences with polycarbonate look particularly impressive and aesthetically pleasing. Despite the external brittleness, chemical compounds provide the density and resistance of the material to various negative factors of impact, therefore, polycarbonate fences have high strength and reliability. Polycarbonate enclosures have an attractive aesthetic appearance and design. 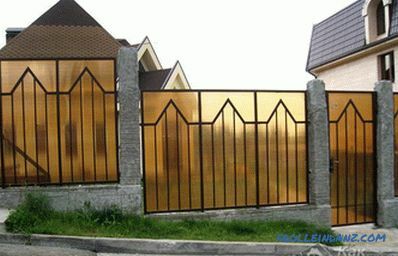 Deciding to build a polycarbonate fence yourself, in order to get a solid and reliable construction, you need to make a plan, calculate the right amount of material, think over the design, prepare the inventory necessary for the work. 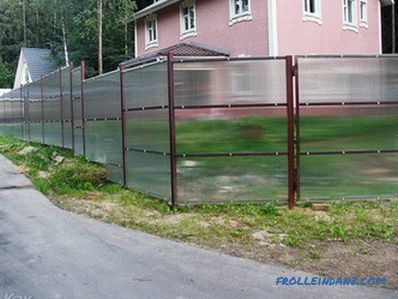 All works on the construction of polycarbonate fences are carried out in strict sequence. 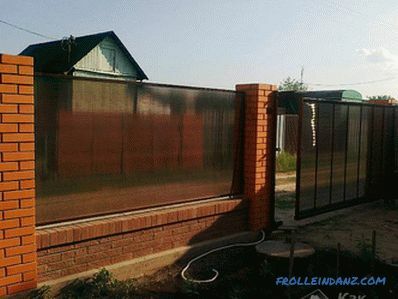 Polycarbonate fences can consist of separate, finished sections or solid sheets ( typesetting design). When installing solid protective structures will require the presence of welding equipment for the installation of special mounts. 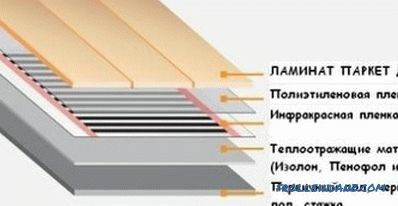 During the construction of the type-setting construction of fences, polycarbonate sheets are mounted on a metal frame, which consists of posts and horizontal bridges. 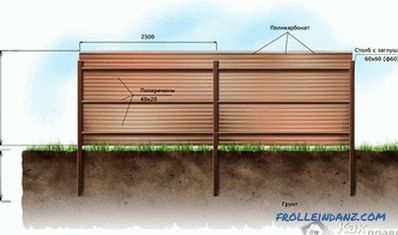 Sectional fencing is performed without welding. 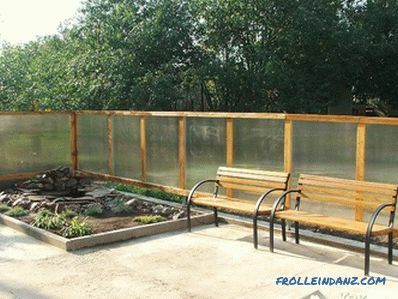 Polycarbonate fences can be installed on a metal or wooden frame. 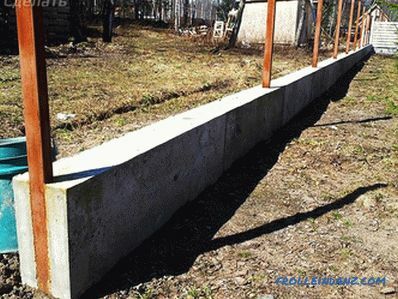 As you know, a quality foundation is the basis for the longevity of any structure. No exception is the foundation. Initially, the installation of support pillars should be marked. Their number and height are determined at the design stage of the fence. Then dig holes for the installation of the pillars. They should be dug below freezing ground. As a rule, it is 0.8-1.2 m. The point of freezing of the soil is better to know for sure. Local land surveyors can provide this information. After you should dig a trench under the strip foundation. 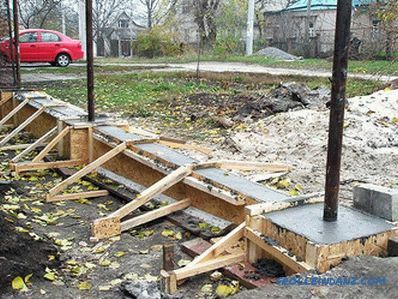 The width of the foundation is 300 mm and the depth is 1-1.3 m.In this case, the pits for the supports are installed deeper than the foundation. They should also be wider than him. If you make a foundation 300 mm wide and 1 m deep, the size of the support pits should be 450 * 450 mm. 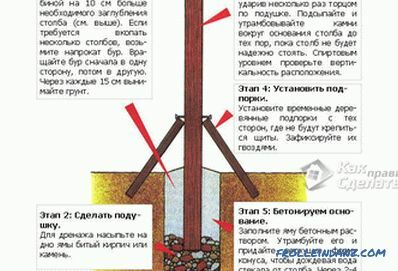 The depth of the pits under the supporting pillars in this case reaches 1.5 m. Make sand pads at the bottom of the pits. For better tamping of sand, it needs to be shed with water. And after making gravel filling. Poles are installed strictly vertically. Fill them with concrete and let them dry for several days. The pitch width between the pillars should not exceed 2 m, since polycarbonate does not cope well with wind loads. If you want to increase the pitch between the pillars, then you will have to purchase a more durable polycarbonate and increase the number of jumpers between the pillars from two to three. The tape foundation must be reinforced. This is done to harden it. For these purposes, reinforcement is used up to 8 mm thick. It is necessary to strengthen the entire foundation, otherwise with time it will begin to stratify, which will lead to the destruction of the fence. To maintain a strict vertical when mounting supports, you should use a plumb. In order for the support pipes to not change their geometry over time, they need to be muffled from above. Otherwise, they will get rainwater, which in winter will freeze and tear the supports from the inside. Welding can only be started after the concrete has completely hardened. 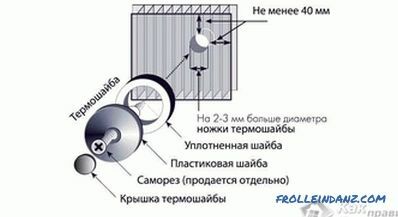 In order for polycarbonate to serve you do not stint longer, make not two, as usual, but 3 jumpers, the distance between which varies from 0.6 to 1 m. They can be fixed to the supporting posts in two ways: by welding or by bolting. After assembling the frame, it must be covered with a layer of primer. 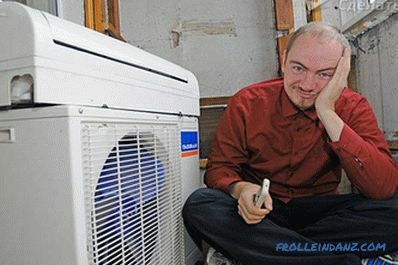 So, you will prevent the appearance of corrosion on the metal. Then the frame can be painted. At the first stage you need to assemble frame made of wood. 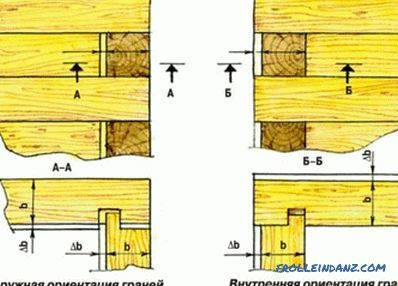 The assembly of the wooden frame is similar to the assembly of its metal counterpart. Dimensions are the same. The only thing that when installing supports in the pits, you need to process those parts that are subject to pouring concrete. They should be treated with bitumen mastic, and then wrap with roofing felt. These measures will prevent the wood from swelling and rotting in the concrete structure. The edge of the lumber, which will be adjacent to the polycarbonate should be as flat as possible, without any bends. Before carrying out further actions, all the blanks for the frame should be soaked in antiseptics, apply a coat of primer and paint. After the parts have dried, they can be joined together. Along the perimeter of the sheet, at its junction with the wooden frame, drill holes having a diameter of not more than 1 mm. The distance between these holes should not be more than 20 cm. Screws, which were previously put on, are screwed into these holes. At the same time between the washer and the surface of the sheet should be left a compensation gap of 1 mm. This action will prevent damage to the material when heated due to cracking. The following tips will help you to avoid the formation of visual flaws on polycarbonate sheets when operating a fence from it. To install cellular polycarbonate on the frame was successful, you should be familiar with the cutting method and the correct orientation of the sheet. The stiffeners of cellular polycarbonate provide for its proper orientation. For example, cellular polycarbonate can be bent, and monolithic - no. 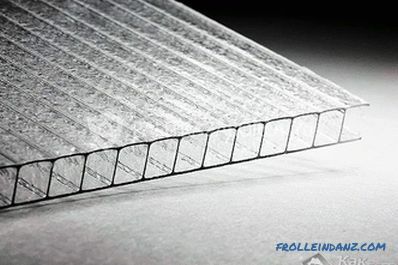 Orientation of sheets of polycarbonate is carried out in the direction of the ribs. If you violate the correct orientation, then the material installed on the fence will simply crack. In addition, if the sheet is set across the ribs, the condensate formed in them will stagnate and the initially transparent sheets will soon darken. It is very important to cut the sheets correctly, which will give the material the desired shape without deforming the edges. It is best to use a circular saw with fine toothed wheels for this. With a high cutting speed, this device provides an even cut that does not require additional processing. In the absence of a circular saw, it can be replaced by a grinder, which is installed on the disk for cutting wood. 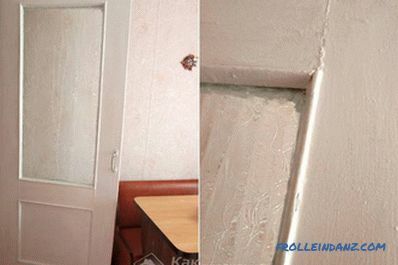 If you remove the protective film from the polycarbonate before mounting it on the frame, it is more likely all, it will be damaged and scratched, so that its attractive appearance will be lost. Therefore, it is better to remove the film after the completion of all work on the arrangement of the polycarbonate fence. Due to thermal compression / expansion of the material, due to temperature differences on polycarbonate, cracks and distortions may appear. To avoid this problem, holes for screws in polycarbonate should be made wider than the diameter of screws. Condensation on polycarbonate sheets is unavoidable. Therefore, when installing the plug on the lower end of the cut, leave a gap of 4 mm between the parts. In addition, it is necessary to drill several small holes in the cap. If moisture / dust / dirt gets into the polycarbonate cells, then the fence immediately lose its appeal. He will look careless. To avoid this unpleasant situation, the ends of all the plates of polycarbonate should be sealed with a special adhesive tape, and then closed with aluminum caps. 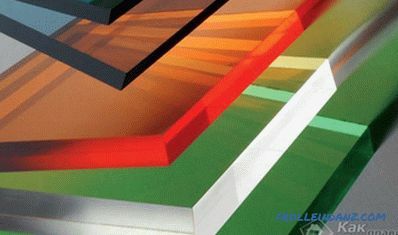 Prepare polycarbonate sheets of the desired size. Cut material using jigsaw using a nozzle with an average size of teeth. The ends of the material are sealed with a special protective tape and aluminum caps. At the joints of the sheets, holes are drilled, which should be 2-4 mm larger than the diameter of the self-tapping screws (this is how the thermal gap is made) used to mount the polycarbonate sheets to the installed frame. In order to avoid cracking of the material, the appearance of cracks in case of temperature differences when fixing is necessary make sure that the sheets are not too tightly clamped by screws. A gap for thermal expansion must be formed between the polycarbonate and other elements of the protective structure. After all the work is done, a protective film is removed from the sheets. To avoid accidental damage, scratches, visible defects, it is not recommended to remove the protective film until all work is completed.